If you have never rode on any of America’s railroad systems, certainly your parents, grandparents and other ancestors more than likely did use the railroad system at least once in their life. The rail system was the lifeline across the country for passengers, food supplies, mail and freight before highway vehicles and airplanes became the dominate means of transportation. So an examination into America’s railway system is essential to better understand just how important this transportation method was to our ancestors. Some for the earliest train systems, that followed canals, small that they were, existed in Boston, Massachusetts and Philadelphia, Pennsylvania in the late 1790s and early 1800s. One of the first major railway systems was called the Mohawk and Hudson beginning in 1826 and running between Albany, NY and Schenectady, NY. Other systems followed, especially during the 1830s and 40s, not just for passengers but for moving coal and other freight items. One of the most famous rail systems was the Baltimore and Ohio Line (B and O) which ran from Baltimore, MD to the Ohio River in Virginia, which at that time was traveling westward. Of course the manufacturing and power sources for the railroad continued to improve quickly, making they go further and handle more box cars. By the time of the American Civil War of the 1860s, the rail systems were a very important element for both sides. It would be President Abraham Lincoln in 1862 who signed the Pacific Railway Act to have the trains system go across the country to the Pacific Ocean. This was achieved by 1869. 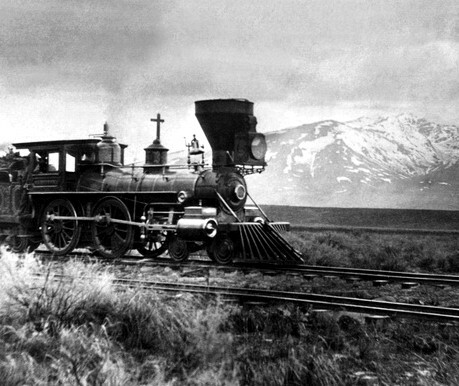 During the late 1800s, trains could reach nearly all regions of America including its territories like New Mexico and Arizona. Having the train system come down along the east coast of Florida between 1890 and 1912 helped develop that entire coastal area, from Jacksonville to Key West. As you examine your family history, do note the change of hometown, major moves a family made at different times. More than likely traveling using railroads may have been a factor. Trains were not just for reaching a new place, but to visit relatives, send merchandise carry the mail. The local hometown train stations were very popular places whenever the trains pulled into the station. Not only did the citizens see who was leaving or arriving, but they got to view the newest batch of mail and cargo arriving in town. Another aspect is to see if you had any ancestors who worked for the railroad system. There were the ones who built the trains in factories, who laid the tracks, who maintained the equipment, plus the engineers and conductors running the trains. If you check, more than likely you had at least one ancestor tied to the railroad system. This site provides some interesting information on most of the major rail systems across the country.